I was recently informed about the new line of Reaper Miniatures that should appeal to the Frugal GM. The Dark Haven Bones collection is a bit limited at launch, but there are twelve different offerings of relatively inexpensive plastic minis. These aren't the over-priced slop & go painted D&D miniatures, but high quality "polymer" minis that are the same sculpts as their regular lines. 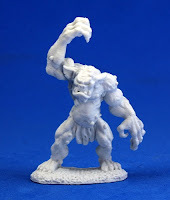 These minis can save the Frugal GM money because they are considerably cheaper ($2.29 for the Bones Cave Troll versus $6.99 for the metal Cave Troll), weight because the plastic is considerably lighter, and time because the figures don't need to be primed and it is considerably easier to alter your figure. 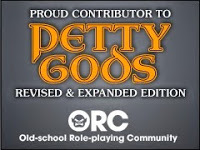 I like to change up figures for my important PCs when I'm sitting as a player. With metal figures you often have to do some serious pinning and gluing, which takes a lot of time. With these polymer Bones figures it is easier to cut and putting it back together just requires some cyanoacrylate adhesive. Any good hobby store will have a slew of adhesives and accelerator. You could alter a figure in less time than it takes to slap on a base coat. Hopefully my store gets in this new line soon.